Imprisoned by her husband, King Henry II, Eleanor of Aquitaine, Queen of England, refuses to let her powerful husband bully her into submission, even as he forces her away from her children and her birthright. Freed only by Henry's death, Eleanor becomes dowager Queen of England. But the competition for land and power that Henry stirred up among his sons has intensified to a dangerous rivalry. Eleanor will need every ounce of courage and fortitude as she crosses the Alps in winter to bring Richard his bride, and travels medieval Europe to ransom her beloved son. But even her indomitable spirit will be tested to its limits as she attempts to keep the peace between her warring sons, and find a place in the centres of power for her daughters. 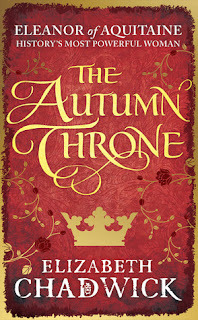 If The Autumn Throne was one of my highly anticipated books of 2016, why then did it take me 6 months to read it? The answer really is quite simple, this is the end, the end of the trilogy, the end of a favorite trilogy, which means it will also be the end of Eleanor of Aquitaine and I didn't want it to end. I had a rough idea of what was going to take place and maybe I figured if I didn't read then it wouldn't happen. How silly is that? Like I can actually change history. In the end I went for the audio version, which was a tricky move since I loved reading the first two books in this series and wasn't sure if this would enhance or take away how I would feel about this book. Katie Scarfe is the narrator and she did a stellar job, giving life to a book that was already full of it. It's no secret that Elizabeth Chadwick is a favorite of mine. The amount of research she does shines through in her books bringing the Middle Ages to life with depth of character and that authentic feel to the story. You feel like you are right there watching history unfold. Eleanor of Aquitaine is a historical figure that I find so interesting. Her story is that of a women well ahead of her time, Queen of two countries, mother of Kings, enduring so much at the hands of a troubled King Henry II. The Autumn Throne continues as Eleanor is still being held hostage by her own husband. and spans the last 30 years of her life. The mother of Richard the Lionheart and John Lackland her life is anything but boring. There is a lot to fit into these pages as life isn't easy, from being Queen regent, the kidnapping of her son (and King), Joanna's return and John is usually up to no good (just to name a few). This will be one of my 'best of 2017' books and I could definitely see myself rereading this series. If you are a fan of Middle Aged HF with strong female character then this series is for you. My hardcover copy and audiobook from my personal library.